Quarterback Michael Brewer, who broke his collarbone in the season opener, returned as Virginia Tech’s starter last week. When Virginia Tech senior quarterback Michael Brewer fractured his collarbone in the third quarter of a season-opening 42-24 home loss vs. No. 1-ranked Ohio State Sept. 7, the injury seemed to derail the Hokies’ season almost before it got started. But after undergoing surgery and sitting out five games, Brewer returned for a cameo Oct. 17 against Miami, completing 3 of 4 passes for 65 yards and a touchdown in a 30-20 loss. He came on after his understudy, redshirt junior Brenden Motley, was pulled from the game. 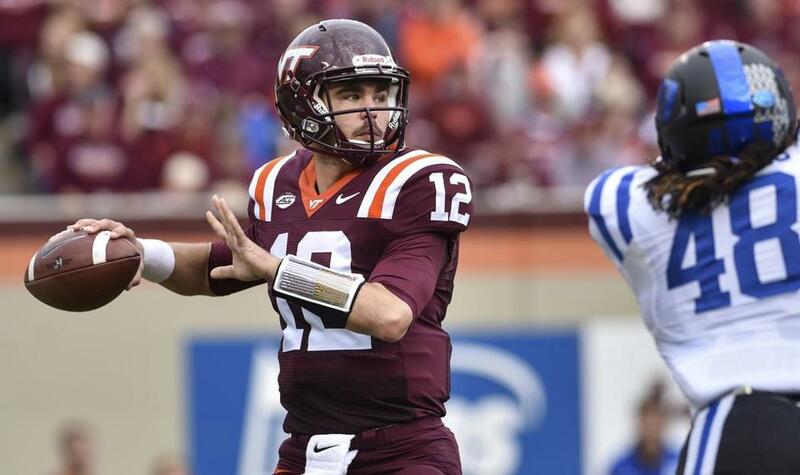 Last week, Brewer was back in his rightful place as the Hokies’ starter. However, even Brewer’s 25-for-45, 270-yard, 3-touchdown performance wasn’t enough to prevent Virginia Tech from suffering a gut-wrenching 45-43 loss to Duke in four overtimes. When Virginia Tech (3-5 overall, 1-3 ACC) attempts to rebound from that setback when it travels to Chestnut Hill for Saturday’s tilt against Boston College (3-5, 0-5), the Hokies will again take their cues from the signal-caller from Lake Travis, Texas. “He’s a tough guy,’’ said Virginia Tech coach Frank Beamer. “I tell you, he’s taken some shots and gotten back up and thrown the ball when he knew he was going to take a shot. “Certainly Motley has some athletic ability and a lot to offer at quarterback, as well,” said Beamer. “And we’ve got a freshman, [Dwayne] Lawson, that we’ve been really impressed with, too. Who is the BC QB? BC coach Steve Addazio said two days of practice this week shed little light on the quarterback situation for his injury-riddled offensive unit. After freshman starter Jeff Smith sustained a concussion crossing the goal line on an 8-yard TD run in last Saturday’s 17-14 loss at Louisville, redshirt freshman Troy Flutie and freshman walk-on John Fadule of Wellesley both prepared this week to take the reins. “The quarterbacks both have had some really good moments and some hard moments, as you would expect,’’ Addazio said Wednesday. “So I think we have to watch the tape. We have to talk as an offensive staff and really take a look at what we’ve done, what we like, what we feel we can pare down, how we feel we’re going to go about it — are we going to go with one, utilize two? A day after the worst loss in program history, a 58-0 shellacking by Clemson, Miami athletic director Blake James fired coach Al Golden seven games into his fifth season. Golden, who went 32-25 with the Hurricanes, bid a tearful farewell to his players Sunday after tight ends coach Larry Scott was installed as interim coach. One player, cornerback Artie Burns, faced even more heartache Monday when his 44-year-old mother, Dana Smith, died of a heart attack. The Hurricanes, who will likely have to do without sophomore QB Brad Kaaya (concussion), will have little choice with a tough game looming at Duke. The coach who will be on the opposite sideline, Duke’s David Cutcliffe, felt for Golden.